If a minority of people are allowed to monopolise social rent, they acquire control over law-making, the tools of coercion and the means of communication. This was the achievement of English aristocrats. Patricians in other countries contributed, but England’s nobility set the pace. They played the single most important role in sealing the foundations of what would evolve into a globalised civilisation. Beginning with a fateful meeting in a field near Windsor Castle in 1215, the feudal magnates dictated a deal to a king that triggered a financial process that unfolded itself all the way through to the sub-prime mortgage racket and real estate financial crisis of 2008. From then on, the feudal barons and knights set out to plunder the public purse. Their mission: de-socialise the rents that funded the nation (see Graph). To legitimise their coup, they evolved a “rule of law” doctrine and a set of parliamentary conventions which, to this day, protect the rent-seeking culture that disfigures people’s lives. Why were the English unable to reverse this unfolding history of exploitation? One approach to teasing out an answer emerges by reflecting on a claim by Lord Neuberger, President of the UK’s Supreme Court. He analysed the formation of the British attitude towards other members of the European Union. He argued that because there had been “No invasion for 950 years [that] is why we don’t like Brussels” (Bingham 2014). The British were suspicious of the EU because “over the past millennium, the UK has enjoyed a more self-contained and stable experience than any other nation in Europe”. According to this creation myth, not since William the Conqueror in 1066 has an alien force successfully landed on English soil. Modern Britain evolved because the people remained free of tyrants. Reality is less edifying. Take, for example, the case of that other William. William of Orange arrived from the continent with an army in 1688 and ended up on the throne of England. Wasn’t this an invasion? Not according to the version authorised by the aristocracy. He was invited to assume the Crown by English patricians who did not favour their home-grown monarch. This they represented as a “Glorious Revolution”. In reality, it was just another inglorious putsch in an unfolding coup d’état against the state that began with Magna Carta in 1215. The mission was nothing less than the privatisation of the state. The process spans 800 years, and it is not yet complete: the rent-seeking culture’s struggle, at all times, is to maximise the flow of social rent into private pockets. 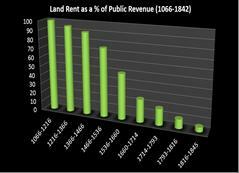 By the 19th century, a trivial 4% was drawn directly from rent to fund public services. This was treason writ large against the people of England. The legacy: an anarchic social system. But the exploitation, instead of being condemned in the court of public opinion, is celebrated as successful nation-building. This perverse reading of history stems from the rent-seekers’ success in wrapping their deeds in slogans of patriotism. This, in turn, empowered them to indict dissenters as traitors. The aristocracy thus fashioned a statecraft based on their greed (Thesis #1). The people of England were co-opted into what evolved into a culture of cheating (Thesis #2). Their ancestors did not sign up to the Social Contract written by, and for, the feudal nobility. Outcome: by the 17th century, land “owners” and their ancillary financial system had established a Welfare State for the exclusive benefit of those with the power to capture the nation’s rents. The shire knights convinced the people of the commons that the nation’s rents were theirs by title – their entitlement. This history will be centre stage on the 800th anniversary of Magna Carta in June 2015 (Box 1). Magna Carta, the agreement between King John and his barons, is popularly associated with the principle of Habeas Corpus. That document, however, also reveals how the seeds were sown that led to the financial coup against the English state. The aristocrats initiated the de-socialisation of the kingdom’s rents by reducing scutage (rents) due to the Crown from its head tenants. This episode is reviewed by the late Sir Kenneth Jupp MC, a judge in the High Court of England who was awarded the Military Cross for bravery in World War 2 (Jupp 2005: 94). Feudal tenants became land “owners” not by acquiring absolute ownership of the land itself, but by capturing ownership of location rents.